We treat disorders of the nervous system including conditions of the brain, spinal cord, nerves and muscles. Our experienced team of pediatric neurologists will develop a treatment plan just for your child. We perform routine inpatient and outpatient consultations, and are available 24 hours a day for emergencies. Our team works with other specialists so that we can provide comprehensive care for patients. Cerebral palsy: Cerebral palsy is a brain disorder that affects muscle tone, movement and coordination. Our team offers a multidisciplinary approach to provide comprehensive, ongoing care. Concussion Program: Our goal is to educate the public about the dangers of concussions. We help kids and teens safely return to school and sports after a concussion. Epilepsy Center: Our Epilepsy Center is a Level 4 pediatric epilepsy center according to the National Association of Epilepsy Centers (NAEC)—their highest level of designation. We provide neurodiagnostic monitoring, clinical trials, and both surgical and nonsurgical treatment options. Developmental Neurology: Our interdisciplinary team provides comprehensive neurodevelopmental evaluations for infants, toddlers, school-aged children and adolescents. We provide families with comprehensive feedback on their child's diagnosis, his strengths and weaknesses, and recommendations for medical or neurological testing and therapeutic interventions. Leukodystrophy: Our multidisciplinary clinic made up of providers from neurology, physiatry, physical therapy, and social work, provide a care plan specific to each patient. Through education, research, comprehensive care, and overall understanding and support, we hope to improve the lives of the children diagnosed with leukodystrophies and their families. Neurogenetic/metabolic: The neurogenetic/metabolic clinic specializes in the evaluation of children with suspected genetic and metabolic diseases causing neurologic symptoms. Those symptoms may include developmental delay, hypotonia, macrocephaly, microcephaly, seizures, and movement disorders. We also focus on the long term neurologic care of patients with diagnosed genetic and metabolic diseases. New Onset Seizure: Our new onset seizure clinic is for children who have experienced one or more seizures. Our team will provide a care plan specific for each patient and provides education and support for patient families. Tuberous Sclerosis: In partnership with the Tuberous Sclerosis Alliance, the Children's Epilepsy Center offers the Tuberous Sclerosis Complex (TSC) clinic. The first of its kind in Georgia, the TSC Clinic coordinates an annual visit with up to seven different physicians to ensure patients with TSC have access to pediatric specialists. This thorough review is then provided to the patient family and to the patient's primary care physician. 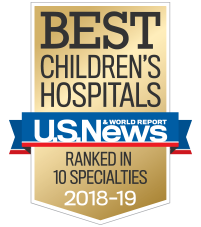 U.S. News & World Report ranks us among the top pediatric neurology and neurosurgery programs in the country. Our program combines the latest proven technology and research with a caring, child-friendly approach, making Children's a top choice for treatment of neurological conditions and injuries. Neurophysiology (EEG) at Children’s Center for Advanced Pediatrics and Children’s at Forsyth are departments of Children’s at Scottish Rite hospital.